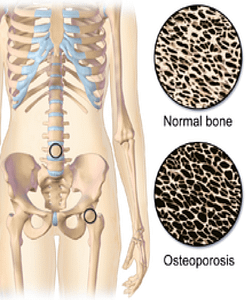 Osteoporosis is a condition that decreases bone integrity and strength. Most common in aging men and women, one the first—and only—signs that osteoporosis is present is a fractured hip. In order to learn more, let’s go over some osteoporosis-related physiology and anatomy, causes, symptoms, and preventative measures. Bones are made up of an intricate combination of elastic fibers and hard minerals. Because bone is living tissue, it’s constantly breaking down and reforming. From birth to around age 30, bone reformation occurs at a greater rate than the breakdown of bone. However, from age 30 and onward, bone reformation equals or is less than bone breakdown. Because of this, osteoporosis (the weakening of bone), can develop. Once osteoporosis has reached the point where it causes a hip fracture, treating the disease, which is in its final stages, is difficult. Thus, preventative measures, should be taken early in the early stages. The hip is a ball and socket joint composed of the head of the femur and the acetabulum of the pelvis. It’s one of the body’s largest joints and an important supporting structure. 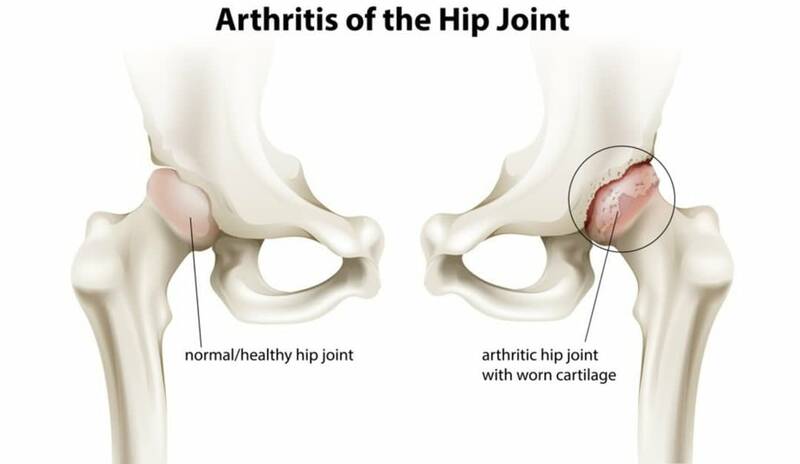 Osteoporosis can cause the femur and/or pelvis to fracture, which disrupts the integrity of the joint. If patients are healthy enough, surgical intervention is used to restore anatomy and function. 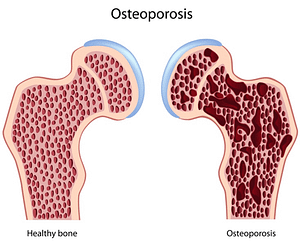 Prevention of osteoporosis should occur as early as possible. Proper diet and a balanced, healthy lifestyle are the easiest and most effective measures. Consuming a diet rich in calcium and vitamin D is recommended. As is resistance (weight training) and non-resistance (jogging, cycling, playing sports, etc.) exercise. The best resource for learning more about preventing and treating osteoporosis is an orthopedic specialist. Their knowledge, training, and skills are used to educate patients and, if necessary, repair fractures. If you or someone you know wants to talk to a specialist, please contact our office. Making an appointment is easier than ever—we’ll get you in ASAP. High Mountain Orthopedics specializes in bone, joint and muscle injuries, including hip injuries. Dr. William Matarese, Dr. Tony Wanich and Dr. Sherwin Su have over 25 years of combined experienced treating orthopedic and sports injuries. Our practice uses a multi-disciplinary approach that includes physical therapy and activity modification. If surgery is necessary, our team utilizes the latest advancements in Minimally Invasive and Arthroscopic procedures to expedite the healing process. If you are suffering from a bone, joint or muscle injury – contact our offices today! We have locations in Wayne, Ridgewood and Englewood, NJ.